With the dark nights drawing in and the cold weather upon us, its hard not to get excited for the festive season! With only 71 days until Christmas, I have already began making plans with my family, I have always loved Christmas and getting together with the people that I love, is by far the best part! But Christmas wouldn’t be Christmas without gifts. So to make the giving and receiving of gifts, extra fun.. I have come up with these creative ideas. A home-made gift is thoughtful and great fun to make, it really get’s you in the spirit of Christmas. Take a look at these blog posts for inspiration..
What about having everyone chip in to purchase a magazine subscription based on the interests of each recipient? There are a lot of great deals online and can work out a great value treat that lasts all year round! Can Include books, movies, games, and even food — basically anything the recipient can enjoy doing, to entertain them over the festive period. A tradition in which members of a family/ group are randomly assigned a person to whom they anonymously give a gift. The names of participants are placed in a hat, and participants draw the name of a person for whom to buy a gift. To make the exchange more fun you could add a theme; decide on your own theme for the year, then everyone’s gift needs to fit the theme. 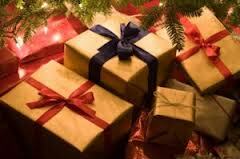 For instance, if you choose “,Red or Green” all the gifts need to be predominantly red or green.